Tesla Motors is in the middle of a quick pivot from the status of "money losing startup" to "profitable automaker." On Thursday the company's fiscal year 2012 SEC filing promised the company would become profitable in the first quarter of 2013, despite massive losses in 2012. On Friday, Diarmuid O'Connell, Vice President of Business Development, penned a blog post promising Tesla would repay the ATVM loan in 1/2 the time required by the loan covenants. Of course that achievement requires that Tesla continue to successfully roll out its plan, of selling electric cars and ramping up production volume. Tesla Motors was awarded loan guarantees of $465 million on the same day Ford was awarded $5.9 billion and Nissan was awarded $1.4 billion. A few months later Fisker was awarded $529 million. All these are loan guarantees under the DOE's Advanced Technology Vehicle Manufacturing Program (ATVM), a program created during the Bush Administration shortly after Pres. Bush declared that the U.S. is Addicted to Oil. O'Connell describes the ATVM program as a "central element of the nation’s last major energy bill, the Energy Independence and Security Act of 2007 (EISA)." Sometime later came the 2008 financial crisis and auto industry bailout, but the ATVM program was created before that whole mess came into being. O'Connell claims that at the time Tesla Motors was "a viable stand-alone entity" with "plans to fund the introduction of the Model S via commercial sources of capital and the proceeds of the Roadster program." However the financial climate in that time period made it hard to raise capital, and they turned to the ATVM program. After a year of due diligence the Dept of Energy awarded Tesla, and other companies, loans for their various projects. That context is useful to remember, especially to think of the results from each of these companies: Ford's loan brought us the Ford Focus Electric, the C-MAX Energi, etc. Nissan's loan brought us the Nissan Leaf. Fisker's loan was frozen, and the company may be about to be bought by the Chinese. Tesla's loan brought us the award winning Model S that appears to be selling as fast as Tesla can make them, at the rate of 1,600 a month. Tesla fully tapped their ATVM Loan to build out the manufacturing plant in Fremont CA. Interest expense on the loan during 2012 was $7.9 million. Tesla is keeping a separate account for pre-funding the payments under the loan program, and for example in Feb 2013 they pre-paid $14.6 million into that account for a payment scheduled on June 15, 2013. While that seems orderly enough, in September 2012 Tesla had to renegotiate the loan program a bit to modify the prefunding schedule of that account during 2012, to put off some of the prefunding payments until Feb 2013, and to work with the Dept of Energy "to develop an early repayment plan for our outstanding DOE Loan Facility on terms satisfactory to the DOE." 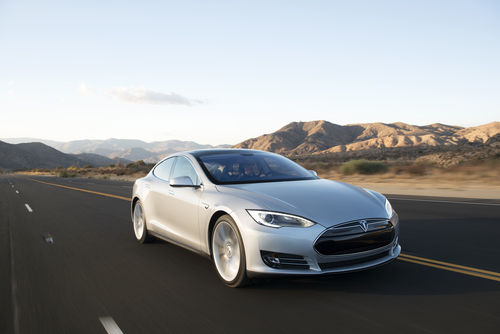 In March 2013, Tesla reached another agreement with the DOE to further speed up repayments to their ATVM loan. Back in the September 2012 time-frame, Tesla did have a money crunch, and had to raise private investment capital totaling $222.1 million. Those last details were disclosed in Tesla's SEC filing from yesterday. Another factoid is that, accompanying the ATVM loan, Tesla gave the DOE warrants to buy Tesla shares beginning on December 15, 2018. The DOE's right to buy Tesla shares depends on the average outstanding balance of the loan at that time. In other words, these stock warrants safeguard the DOE's ability to be repaid in case Tesla's business doesn't work out as planned. All this together means Tesla Motors has several incentives to repay the ATVM loan more quickly. First, the company will not spend as much on interest payments. Second, the Dept of Energy requested, according to Tesla's 10-K filing for 2012, the faster repayment schedule. Third, the five year repayment schedule, if met, lands prior to the moment in time when the DOE could start exercising warrants to buy Tesla stock. The plan to repay the ATVM loans early gives us the impression that Tesla thinks its financial status is, and will continue to be, rosy. However there is a bit more to the picture and there are business/financial goals being met as well. This assumes Tesla becomes profitable. So far, every prediction to that end that has been made has been wrong. I have no doubt that the company will eventually turn a profit, but since the prediction is always "next quarter" and then gets pushed off to "next quarter" when that one fails, I'm not holding my breath that this will be the magic year.